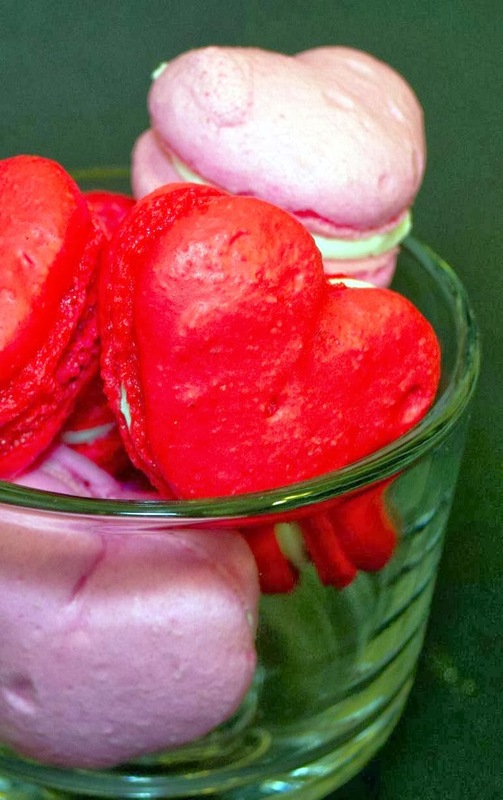 For this Valentine's Day treat, almost any macaroon recipe will work so long as red, pink, or similar colors are used for the right theme. These yummies are made following Martha Stewart's French Macaron Recipe with Swiss Meringue Buttercream fillings. Of course, the macaroons have been formed using a heart-shape baking mold. Pulse confectioners' sugar and almond flour in a food processor until combined. Sift mixture 2 times. Transfer batter to a pastry bag fitted with a 1/2-inch plain round tip, and pipe 3/4-inch rounds 1 inch apart on parchment-lined baking sheets, dragging pastry tip to the side of rounds rather than forming peaks. Tap bottom of each sheet on work surface to release trapped air. Let stand at room temperature for 15 minutes. Reduce oven temperature to 325 degrees. Bake 1 sheet at a time, rotating halfway through, until macarons are crisp and firm, about 10 minutes. After each batch, increase oven temperature to 375 degrees, heat for 5 minutes, then reduce to 325 degrees. Sandwich 2 same-size macarons with 1 teaspoon filling. Serve immediately, or stack between layers of parchment, wrap in plastic, and freeze for up to 3 months. Place whites and sugar in a heatproof mixer bowl set over a pan of simmering water. Whisk until sugar dissolves and mixture registers 160 degrees on a candy thermometer. Remove from heat, and whisk on high speed until mixture is cool and stiff peaks form, about 6 minutes. Beat in vanilla. Use immediately. Leave meringue in a mixer fitted with a paddle attachment. Add butter, 2 tablespoons at a time, on low speed, mixing after each addition. Beat until smooth, about 3 minutes. For chocolatey version, see recipe for nutella macaroons.